I've been chipping away at my TiVo backlog the past few evenings, staying awake until the wee hours of the morning and watching entire seasons of shows I couldn't before--not while LOST was taking up so much room in my brain. But you can relax. I'm not winding up to rehash a bunch of shows that are over and done with. I have a much more lofty purpose in mind. My family was never one for the latest in gadgetry, seeing as how we were what is now commonly known as the working poor; my mom was the only one who worked, and so we were poor more often than not. But we had a console Curtis Mathis television set ("The most expensive television set in America; and damn well worth it") and the very first microwave oven on the block. I think my dad may have traded one of our cars for the TV; the microwave must have fallen off a truck. After my mother demonstrated that she could scramble eggs in only twice the time and with four times the effort it would take to cook them on top of the stove, she turned her attention to microwaving popcorn. She was well ahead of the trend, there. 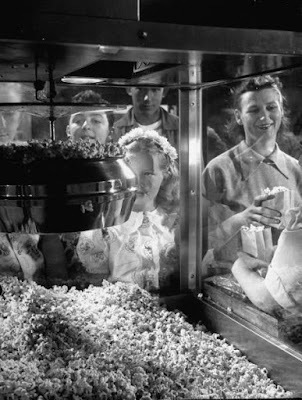 Many, many years later, there are at least dozen brands of popcorn specially packaged to be popped in the microwave. My own personal favorite is Pop Secret Jumbo Pop. Which I can't find anywhere, anymore. Of course. And that's when I remembered my mom, cooking up some corn in a brown paper bag. So the last time I shopped, I picked up a bag of regular popcorn. My friend Ernie Buffalo was just talking about how surprised she was to find that in this instant age, one can still buy such a thing. In fact, it is ridiculously inexpensive, especially when compared to microwave popcorn. Measure 1/4 cup popcorn and add just enough oil to coat each kernel. Pour it into a lunch-sized paper bag, and fold the top of the bag down two-to-four times. Place the bag upright in the microwave and cook for the traditional 2-3 minutes. Just listen for the popping to slow down. The result kicks the legs out from under any popcorn you've ever eaten, especially if you top it with a generous helping of real melted butter. Which I do, because I have the arteries of a 20-year-old. related: Just Wrong. In so many ways. I guess I will have to try it. Though apparently my family bought their first air-popper machine after a lil 3-year-old me pulled a hot pan of popping popcorn off the stove and burned my hands. I have a feeling I can manage not to burn myself this time. And after all, my favorite microwave popcorn is PopSecret Homestyle, with real Land-o-Lakes butter.... so perhaps I'd really like it "homestyle" indeed! I'm making this today. Too easy. Remember the big dome poppers? We used those illegally in the dorm about thirty years ago. The teflon bottom made a dandy hotplate. Prior to that it was all Jiffy-Pop, baby. I do the same though on the stove top. Take an average size stockpot, add the popcorn and oil. Next you cover the top with aluminum foil, cutting a few slits to let the steam out. Put the pan on the stove, crank the heat to medium high and grab some oven mitts. As the stove warms up slide the stockpot back and forth over the heat. As always, listen for the popping to slow down and remove pot from the heat. My favorite is to add popcorn to a large bowl and top with Cavender's and a bit of Kosher salt.